The randje per week challenge chart of the week was completed on Saturday. The TAST challenge break will last till 16th August. Another motif was completed during this week. The pattern is such that, the working on each motif is continuous. 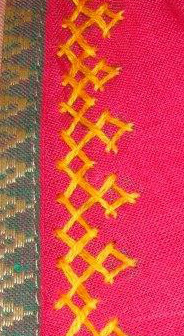 Actually I started my kutchwork lesson with the simplest version of this motif. Though it is repetitive, it is also relaxing. But have decided to work one motif per week. This week, another tunic which was sewn earlier took my fancy. So yesterday, a small kutch work border was started below the woven border. Will there be any embellishments such as mirrors or beads? This is still undecided. Thought will go with the flow of the work and decide later. The other kutch work border on green fabric was ignored this week. 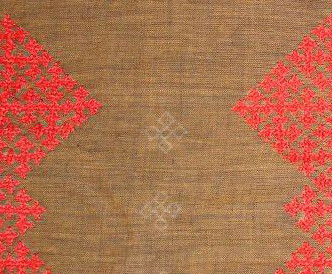 There was a kasuti embroidery pattern which gave rise to an idea of a kutchwork pattern. The possibilities are being explored. 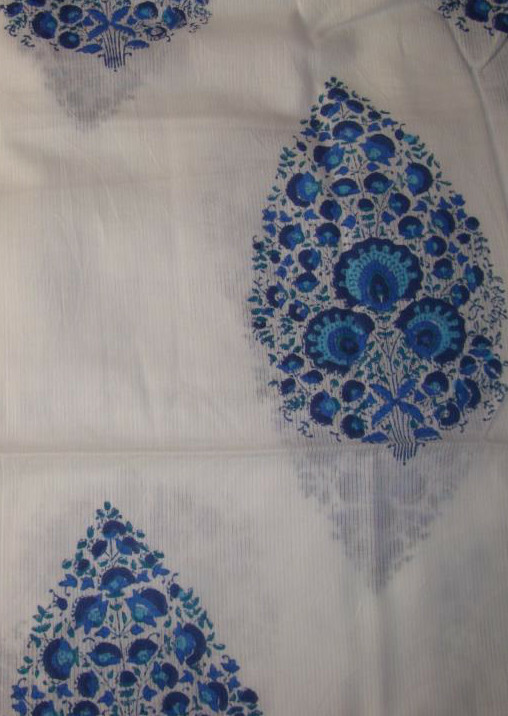 The block printed white fabric was picked up from the tailor. It has blue borders around the neck and sleeves. I am happy with his work. The size of the mirror needs to be chosen. 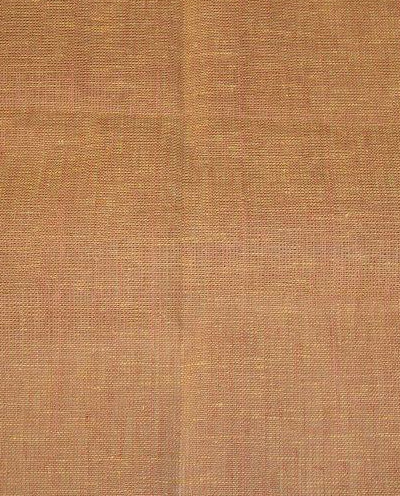 The beige fabric is given to the tailor for marking. The design for sleeves and tunic front was drawn on graph paper. This may not be a small project, with 172 mirrors. Implementing to work a small project seems moving further away. I am linking these blogs. The Randje per week 2016 chart was completed on Saturday. SharonB has announced a break of 4 weeks on TAST challenge. The next challenge stitch will be on 16th August. Though I am not working all the stitches during this challenge, it is nice to see the different possibilities of the stitches created by other members. There are some blogs which host weekly link of the works in progress. We can link our blog weekly to that post. It is interesting and motivating to see the works of other people. These links are more for quilters. 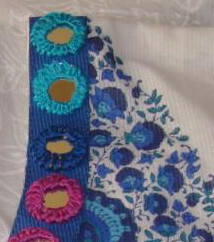 This is one such blog where we can post our embroidery works too. Super Mom! I completed two motif patterns on this project. Three more to go in the first phase. Sometimes while browsing for inspiration, the choices are so many that even after completing a project a longing is there to improvise. This time, while looking at the design for sleeves for this tunic project, an urge to add another design element came to mind. So some changes were made. Hoping to control these urges, at this rate, none of the projects will get completed, and even if they do, the satisfaction may not be there. Keeping aside the brown piece for a while, the kutchwork on this green fabric was started. Yes it is the same green fabric from the chikan work tunic. This is continuous border design for sleeves. This is my friend’s tunic project. The design was completed during this week. And my friend traced them on to the fabric. While looking for inspiration from this book ’3,000 decorative patterns of the Ancient World’ a small geometrical design seemed apt for a mirror work embroidery. The fabric is hand loom cotton.